Lately I have been embroiled in an incredibly difficult ethical dilemma, the nature of which I am not currently at liberty to reveal. Unfortunately there are a few therapists out there that risk tarnishing the profession and may cause clients harm. One of the BACP's roles is to protect clients. I would not consider being a counsellor without being part of a professional body. "The British Association for Counselling & Psychotherapy (BACP) is a membership organisation and a registered charity that sets standards for therapeutic practice and provides information for therapists, clients of therapy, and the general public. 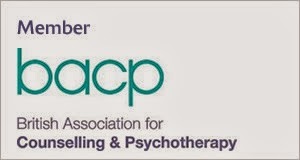 As the largest professional body representing counselling and psychotherapy in the UK, BACP aim to increase public understanding of the benefits of counselling and psychotherapy, raise awareness of what can be expected from the process of therapy and promote education and/or training for counsellors and psychotherapists." The point of this blogpost is to urge those seeking a counsellor or psychotherapist, or those helping others find a counsellor or psychotherapist, to make sure that the person they choose to go with, or the organisation they seek counselling with is a member of the BACP or the UKCP (a similar organisation with similar aims). Without this, in the event of a complaint there is no recourse or accountability. Seeing a member of either the BACP or UKCP offers some protection, as if you feel that your counsellor/psychotherapist has acted unethically towards you then there is a complaints procedure whereby you can make an official complaint and it will be investigated. If there is a serious breach of ethics then the practitioner may be struck off the register. The sad thing is, anybody can set up to become a counsellor without insurance or membership of a regulatory organisation. Hopefully, government policy will change on this, because as it stands, there is nothing to stop unethical practitioners from abusing vulnerable clients or acting unethically. Amanda Williamson is a professional counsellor working privately in Exeter, Devon. It sounds like you have not been a subjected to a complaint. The bacp does not treat its members faily. You are guilty before you walk into a hearing. One can be proud to be a member of the BACP but it changes when you have a client who mis- understands what has been said to them and then complains. I am all for protecting clients like you. But I am also what support from Bacp which you will never get. Hello, and thank you for your comment. It is very useful to hear a different perspective. Do you have any suggestions as to where I can investigate the points you make further? I am with you on this Amanda. Sadly there are a few rotten apples in every barrel. I would be asking clients to consider why a therapist would NOT want to belong to an organisation(BACP or simlar)which offers an understanding of ethical practice and a place of recourse should clients feel they need it? Counsellors have liability insurers to be 'on their side' in case of being wrongly accused - again something I would ask clients to check their therapist has in place. Unfortunately, I had to delete a couple of comments. Under the circumstances, it seemed the appropriate ethical thing to do. I cannot name this person, or go into the reasons. But rest assured, it is only due to very unusual, complex circumstances that will unfold in time, that I deleted somebody's comments. I do not know the ins and outs of governing bodies and like. All I can say is I put my trust in you and never once did you let me down or give me any course for concern, despite the heavy burden I was putting you under. I hope your embroilment is over soon and you have a satisfactory outcome to your dilemma. From someone who is eternally grateful. Thank goodness there are people/psychotherapists like you. It only takes the strength and integrity of one, such as yourself, in order to give others the courage, and the strength, to fight against those who prey on (who they think are) the vulnerable. They obviously weren't very good judges of character. Well done! Keep up the good work. I'm sure people seek therapy for a vast number of reasons. I'm certain that many of them are at their most vulnerable and taking a "leap of faith" when deciding to go down the route of sharing their feelings and experiences with another person. It shocks me that counsellors are allowed to operate at all outside of a professional body and it's a sorry reflection of the way in which we tend to disregard mental health in this country that this is the case. Perhaps it may be worth opening a petition on the government's e-petitions website Amanda. It sounds from your comments above as though we're in a situation where professionals taking care of pets / fixing our cars / digging our roads are subject to more stringent monitoring than those we trust with our mental health. Thank you for raising this as I'm sure many are totally unaware! This is an EXTREMELY serious issue, and one that needs to be addressed. Therapists are in a position of power, often with extremely vulnerable people. There needs to be checks and regulations, in the same way there is with teachers. Thank you for bringing this to attention for us. It'll certainly make me wary if/when seeking therapy. To open up to anyone, about anything, you need trust. You don't spill your heart to every stranger in the street. The random barfly isn't (usually) your closest confidante. Without trust how does something as close and utterly personal as therapy work? You have to feel trust in the person who you approach, in the structure that supports you (and them). If that network, that structure doesn't work? If it doesn't even exist? How does therapy even begin to be a professional service? How can it work? That you yourself, who work in the field of counselling and therapy feel the shift in trust... well. It beggars belief to be fair. I feel for you Amanda. And hope that this whole matter is dealt with swiftly and positively. And trust is restored, for you and all those on both sides of the counsellor's desk. This does seem a tough one from the point of view of all concerned; clients, therapists, and the government. Counselling provides a unique experience, and can employ some potent techniques. That is not to say clients are under control, but the nature of requesting assistance in one’s life can open one up in a way that not everyone expects. In the right hands, i.e. Amanda’s, the experience can prove very useful and healing. In the wrong hands, the techniques might perhaps be used to weaken a person’s resistance to manipulation. General knowledge and understanding of counselling isn’t always the best, so people may well not understand it enough to judge whether there is danger or not. I have been aware that the government has been trying to bring about statutory regulation for therapists for at least 5 years, if not more. (Search Google for “statutory regulation of psychotherapists and counsellors”). For whatever reason, it hasn’t happened yet. The last post date on the BACP website for this issue is March 2010. Since then the change of government has got in the way, as well as various consultations between the HCPC (Health & Care Professions Council), BACP, UKCP and the new government. Another difficulty I heard is that it would need to cover anyone who is in an “emotionally healing” profession. This could include a number of alternative therapies that aren’t strictly counselling. Such is the minefield the government faces. For example, it would be hard to request an energy healer to undergo counselling training. So in the absence of any immediate statutory regulation, I wonder what is left. Voluntary membership with BACP/UKCP by practitioners, for one. Spreading the word as much and clearly as possible, about why it is a very good idea to seek practitioners who are members of BACP or UKCP. A deeper general knowledge in the public about talking therapies. How they can be really useful to the right people at the right time, but also require emotional investment and that carries a need for a sound and caring practitioner. I am sorry that anyone can be subjected to this vile treatment. I hope your complaint raises awareness of what this person's intentions are. It has been suggested that this may be the nefarious workings of a cult masquerading as honourable Christians. (It is no surprise that society has become secular nowadays, as there really are very few examples of good deeds performed by so-called servants of God - especially if this is the workings of a cult) In order to respect the beliefs of those who do intend to do good, and in order to steer this comment out of the murky waters associated with religious debate, and back to this case of blatent sexual harrassment, I would like to express my faith that while these people are being exposed by this coverage, they will surely be forced to lie low, and in the meantime, the relevant authorities have no choice but to investigate this matter, review and change current security procedures and ensure no future reoccurrences. I deleted the comments because they were written by Lindsey Talbott, a counsellor, supervisor and director of Palace Gate Counselling Service, recently struck off for amongst other things, threatening and bullying communications with complainants in the case.